Babyology exclusive - Little Chipipi Moveables wall stickers will light up the night! 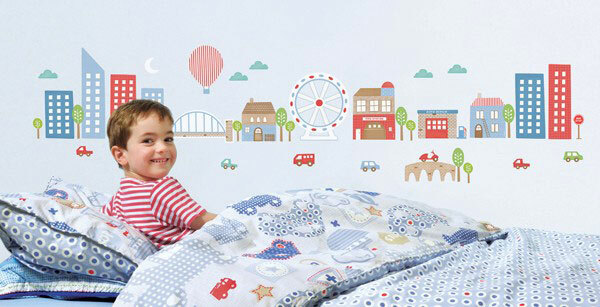 Babyology exclusive – Little Chipipi Moveables wall stickers will light up the night! Be among the first to stick up new (and very clever) designs from Little Chipipi. Little Chipipi is well known around these parts for their spectacular Moveables wall stickers. Easy to apply and easy on the eye, Babyologists you will love the two new designs available. If you have a child who adores the bright lights of the city, the gorgeous Glow Town is right up their alley. The Glow Town Moveables sticker set uses thirty-nine stickers to create typical city hustle and bustle complete with skyscraper buildings, homes, amusements and traffic – even a Vespa! Magic awaits when the last bedtime story has been read and the lamp is turned off, this cityscape comes to life, lighting up the dark with glowing windows, bridges and Ferris wheel! If you have children growing at rates that you just can’t keep up, you need the new Moveables Height Tree. Measuring all the way up to one-hundred-and-fifty centimetres this will be in use for quite some years! The Height Tree includes thirty-eight stickers and a menagerie of cheeky animals including a koala, giraffe and a perfectly plump purple owl. Fourteen name and date tabs are included so you’ll never miss a growth spurt! Little Chipipi use stunning prints and beautiful vibrant colours in creating their Moveables wall stickers and they’re so easy and quick to apply to your walls or surfaces for instant wow-factor. Moveables are completely removable and can be repositioned many times over so you can transfer your heights and city lights wherever you go. Glow Town priced $99.95 and Height Tree $79.95 are available from Little Chipipi. Delivery is available all over Australia, so go choose a set and prep your wall!